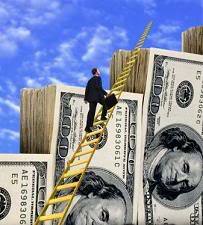 The Financial Ladder: Personal Finance...Vlogger? Yeah, I said "vlogger." That wasn't a typo. It's short for the brand new and upcoming medium "Video Blogger." I don't know about any of you, but this is the first I'm hearing about it. Apparently it's starting to become a booming form of internet media. There are now approximately 6,500 vlogs out there, and growing fast. That's more than 6,200 from the year before! Good news for any vlogger out there, advertisers like the online video spots. Internet video ads reeled in $225 million dollars last year, and are expected to break the $1 billion mark by 2008! The overhead for producing a vlog is low, and the potential for getting advertisers is good for this new and hip Internet medium. The most popluar vlog on the net is a satirical news show named Rocketboom. They report to have over 250,000 visitors a day, and growing. They've recently auctioned off ads for their vlog on Ebay, the winning bid was $40,000. In October I-tunes offered vlogs for download as video podcasts giving the the vlogger world a potential audience of 40 million ipod users. Some of the other popluar vloggers out there are MobuzzTV, and Tiki Bar TV. So, with the combination of money and logging, who out there will be the first personal finance vlogger?